Not only does FamilyPrint depict this candid wartime experience with words, but also via the breathtaking photography of Nathan Rowe, who beautifully captures the agony of separation and the utter joy of coming home. Author Tim Stoner has returned to his position as the director of the infrastructure and security practice at a consulting company. He remains an active soldier in the Army National Guard. Author Tiffany Stoner is Chief Home Officer of the StonerSix. In addition, she works part-time for Accenture and owns her own photography company, Nathaniel Edmunds Photography. 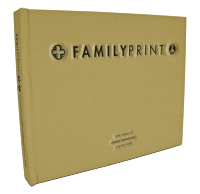 The 224-page, full-color coffee table book is available at www.familyprint.org.